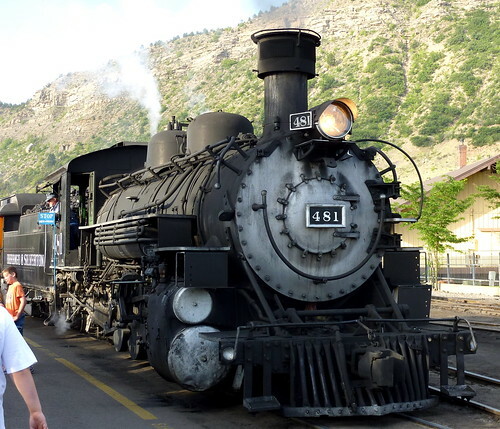 I got up at 5:30 am today and headed for Durango to catch the steam train to Silverton. I discovered a McDonald’s near Pagosa Springs where I grabbed breakfast and used their WiFi, then drove on to the depot at Durango, admiring the steam train that was heading out. Some fine looking fellows in period clothes turned out to be members of a vaudeville group at a nearby theater, drumming up business. Visiting the gift shop, I picked up some DVDs on the railroad and a guidebook, then found the Silver Vista car I’d picked out for this trip. That car, featuring a glass roof, wasn’t around when my father and I rode the train 19 years ago. So I splurged this time around for the fancy car with complimentary beverage service and, to my surprise, a free tote bag with mug and pin, all geared to help advertise the railroad, of course. I was seated near a family of three for the trip to Silverton who turned out to be a husband and wife, who both teach choir in Austin, TX, and their teenage son. The father had been involved with the wedding of one of my former students and these folks were great companions for the trip out. After we cleared the city we had fun racing our iron horse against a rider on horseback, who galloped ahead of us for a bit until terrain and biology intervened. We passed beautiful Shalona Lake, and then could see far below us the river the railroad runs alongside, the Rio de las Animas Perditas, or River of Lost Souls. The river is fast and steep, dropping about 45 feet every mile. The train was chugging away, lifting us toward Silverton, and we were approaching the famous High Line, where the train runs along the bluffs hundreds of feet above the Las Animas. Last time I was here I got some great stills of the train along here, but no video, something I rectified this time around the bend (see end of this post). The view of the train rounding the bluffs and the surrounding scenery are recognizable from several old western movies, and for awhile we could spy the Las Animas in the narrow gorge far below. Bluffs towered above us, visible through the glass roof, as we squeezed through and around the deep cuts. The train was pumping out smoke and cinders as we slowly rose thousands of feet, and some peaks of the Needles mountain range were visible at times. My companions took a photo of me as we passed through the woods. We passed a watering tank, vital for the long hard journey for our steam engine, and passed an abandoned bridge at Elk Park. We finally approached Silverton after a four hour trek, and could spy some abandoned mines on the mountainside. Silverton boomed in the 1870s when gold and silver were found and a treaty had been negotiated with the Ute Indians. It swelled to 4,000 by 1874 and mining peaked from 1900 to 1912 with the town reaching 5,000 before the mines played out and the town slowly diminished. The last mine closed in 1991 and today Silverton has 300 permanent residents who rely on tourism. The town is 9,300 feet above sea level, one of the highest in the world. I had lunch in a building that was once one of the earliest brothels – I think it was the same place my father and I dined 19 years back. Then I wandered the streets, with a horse-drawn carriage passing by as I made my way to the town museum, which is being expanded and was better than expected. I enjoyed touring the tiny old jail and giving a cell a tryout, but the standout item in the museum was a mining “Potty Car” used in the early twentieth century for some welcome relief for the miners deep underground. I then reboarded the train, pulled by engine 486, and relaxed as we slowly wound our way downhill, stopping for some more water for the engine and then retracing the marvelous High Line, spotting some kayaks down below this time through. It was a fun trip, but after eight hours aboard a train I was ready to sit somewhere without being jostled as the car wiggled and banged on the 3-foot wide narrow gauge track. A McDonald’s adjacent to the depot was a convenient spot to get a surprisingly tasty grilled chicken salad and sit in an unusually nice booth to edit my photos. Unfortunately, the free WiFi at this McDonald’s was misbehaving (as usual) and wouldn’t grant a connection to any of my devices. So I finished up my work and drove back to the McDonald’s at Pagosa Springs to see if I could upload from there. That worked and I wrapped up my day. Rain threatened this afternoon from Silverton to Durango, but we never got more than a few drops. Tomorrow I go hiking along the Piedra River, hoping that the weather will again cooperate.